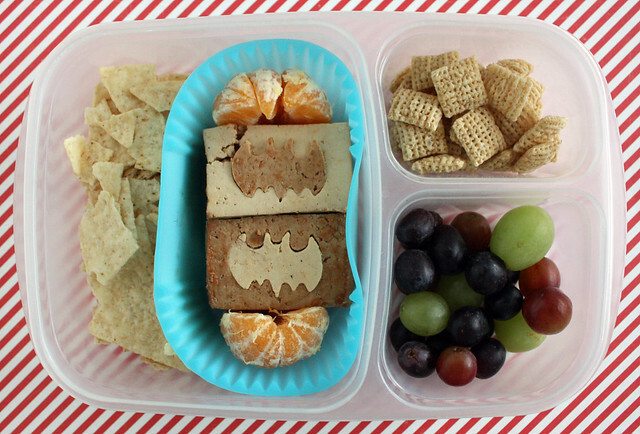 I have a huge, long bento post for you today that spans two weeks. I missed last week’s update because I was slammed with a big project deadline so you’re going to get a bunch of photos today. Woo hoo! 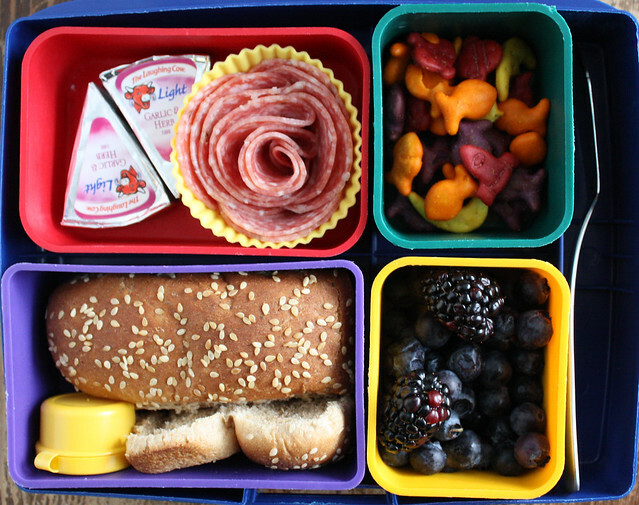 Last Monday, Wyatt had a couple Laughing Cow cheese wedges, a salami “rose”, goldfish crackers, blueberries and blackberries, a whole wheat hot dog bun and a little tub of strawberry jam. I had to cut the bun to fit but it all worked out. 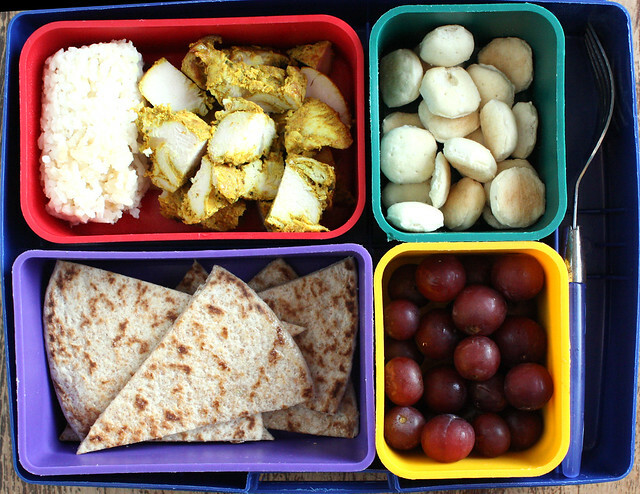 This lunch was packed in our Laptop Lunch Box . 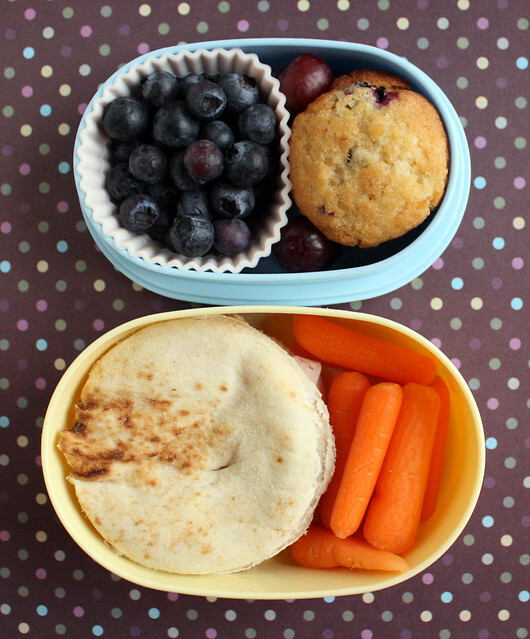 On Tuesday, Augie had blueberries, a mini blueberry muffin, a few grapes to fill the gap, carrots, and garlic naan cut into circles. 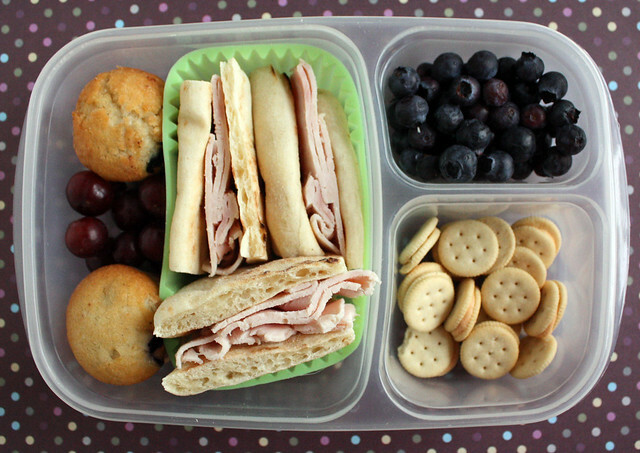 Wyatt had two blueberry muffins, grapes, turkey sandwiches with garlic naan for bread, blueberries and mini cheese sandwich crackers. This was packed in the Easy Lunchbox . 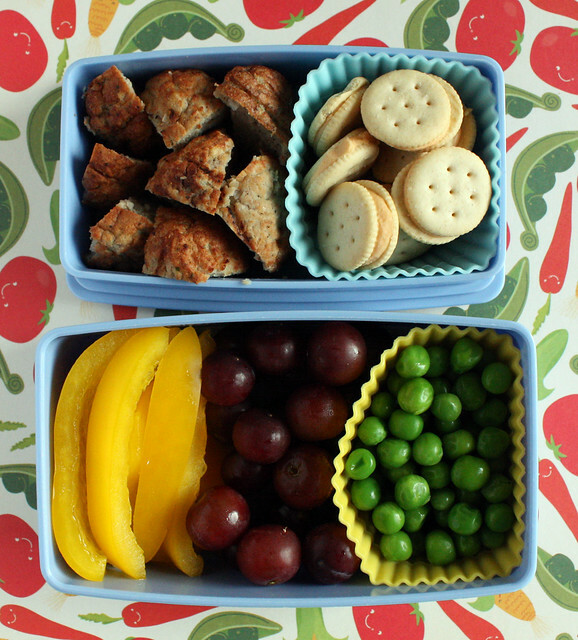 On Wednesday, I packed freezer meatballs, cheese sandwich crackers, peas, grapes and yellow bell pepper slices. Though Augie usually eats all of his lunch, most of this came back home with him. I guess he just wasn’t hungry. Wyatt had a rice ball (made with a mold similar to this one ), leftover curried chicken from dinner the night before, oyster crackers, grapes and a piece of flatbread that I toasted, spread with a smidge of butter, sprinkled with garlic salt and cut into wedges. On Thursday, I totally, completely, 100% forgot to make Augie’s lunch until we had our shoes and coats on and were heading out the door to preschool. I only remembered when I went to the fridge to grab his lunchbox and it wasn’t there. 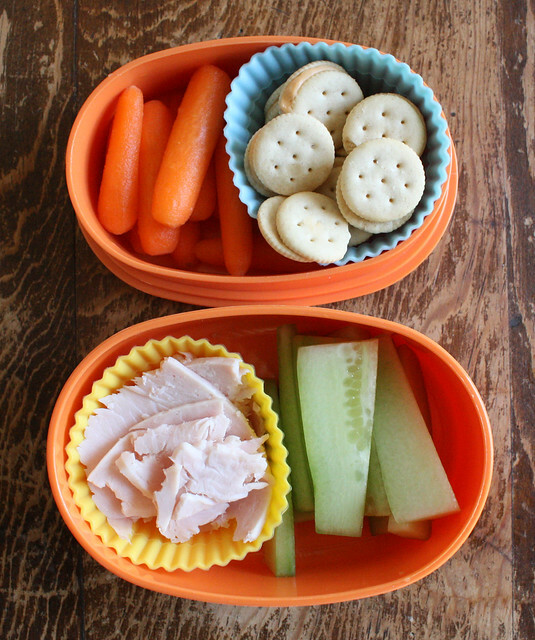 I threw this kind of skimpy lunch together in about 3 minutes flat: carrot sticks, cheese crackers, cucumber slices (thankfully pre-sliced and in the fridge) and deli turkey that I ripped up with my hands in attempt to keep him from shoving huge slices in his mouth when he sat down to eat his lunch. On Friday, I was on my game, so I spent a little extra time on the kids’ lunches. 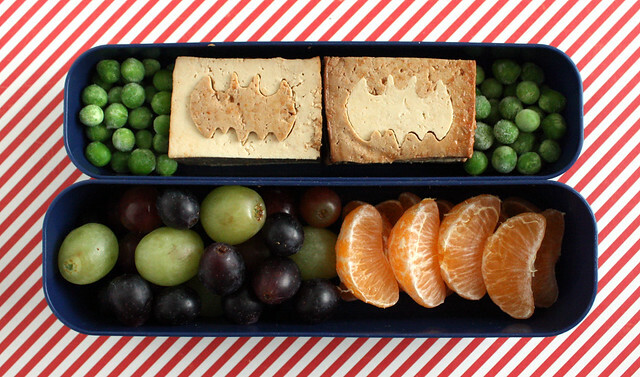 Augie had peas (still frozen in this picture but they thaw by lunch time), baked tofu that I cut with the Batman cutter, grapes and clementine slices. And now on to this week’s lunches! This week Wyatt chose Monday for his school lunch day because the cafeteria was serving cheese pizza. He reported that it was “totally delicious” but I have my doubts. Tuesday, I packed special Valentine’s day lunches for the kids which I posted about earlier in the week. You should go check them out if you haven’t seen them because they’re my favorite lunches I’ve packed in a while. Wednesday morning I wasn’t feeling well so my husband got up with the kids. To make things go more smoothly I had Wyatt buy lunch at school again. 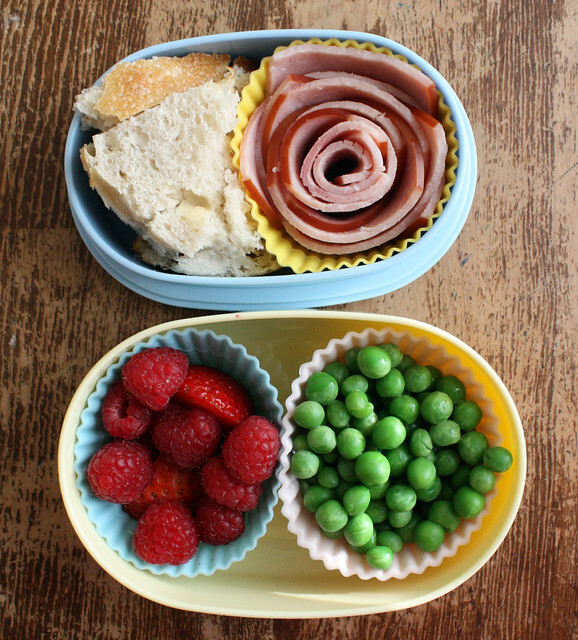 I was feeling better by the time we needed to make Augie’s lunch so I put this bento together for him: leftover bread with roasted garlic baked in, a ham rose, peas and a few leftover berries that I found in various containers. 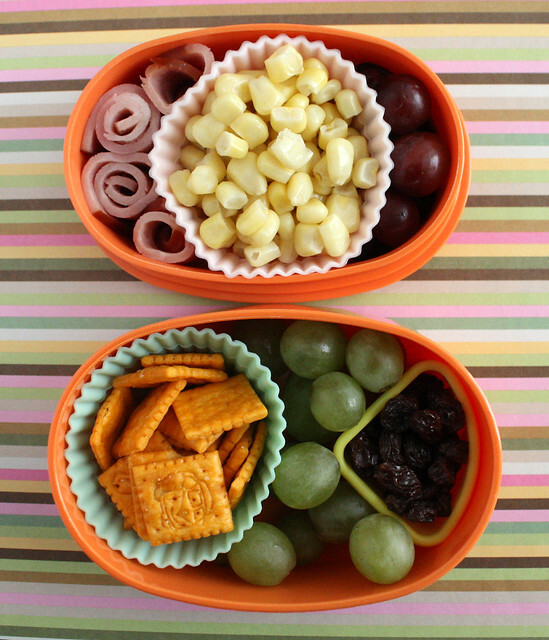 Augie’s lunch on Thursday had ham roll-ups, corn, purple grapes, raisins, green grapes, and Cars-themed Cheez-its. 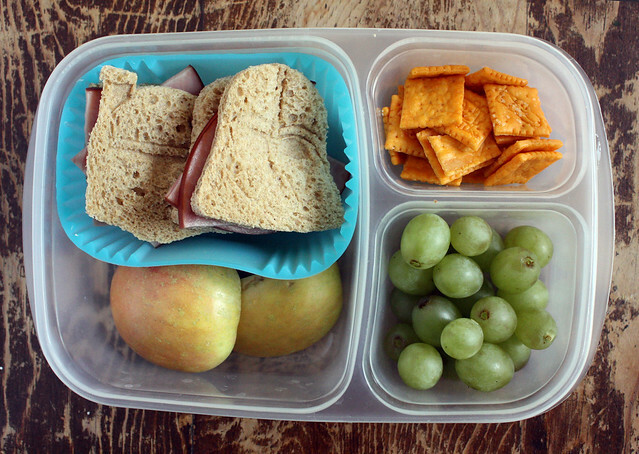 Wyatt had ham sandwiches cut with the Star Wars cookie cutters, apple chunks, Cheez-its and grapes. The faces didn’t come out very well on the sandwiches this time so if you can’t tell, that’s Boba Fett and Darth Vader. Today we were basically out of food because I haven’t shopped all week. I had to scramble to find enough to fill Augie’s lunch box, and by the time I was finished, I didn’t have anything left for Wyatt’s lunch. Yikes! So he had school lunch again. 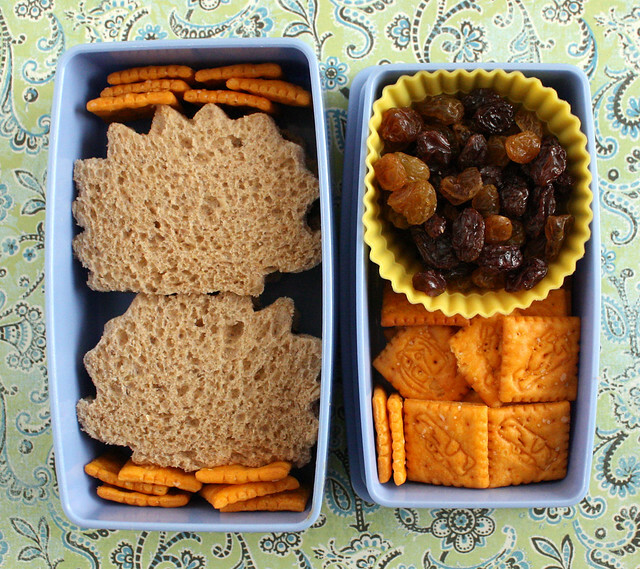 Augie had pb&j sandwiches cut into hedgehog shapes, the last of the Cheez-its and the last of two packages of raisins. And now, I better go shopping so we have something to eat for dinner! Have a great weekend!